Although Stephen Hawking was an atheist, his final warning about the future deserves attention. He considered near earth objects (NEOS) a top threat of extinction to humanity. NEOs continually do threaten earth and pass harmlessly—so far. 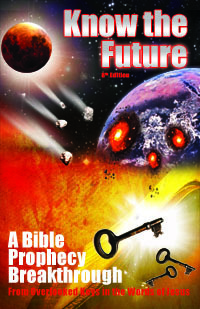 Although scientists are concerned, Christians probably fear missing the rapture and facing the Antichrist a lot more than such an Armageddon/Deep Impact scenario.If they only realized that there is an explicit prophecy of an asteroid impact on earth before the rapture and Great Tribulation even happens. Learn this prophecy and how the Bible indicates it happens…and where the righteous will be protected from it. Jesus said “in this life you will have trials” (John 16:33) yet Christians receive no comprehensive training on how to “suffer well.” Frankly, the concept of enduring trials with “joy” like Jesus’ brother James describes sounds crazy and unattainable (Jas 1:2). That’s what I used to think, too. After nearly losing our firstborn son and staying with him at the hospital for 24 days, we learned some helpful keys to maintaining real peace in trials. This podcast shares how we stayed in faith throughout the ups and downs. Includes a major breakthrough Tim made that can help everyone who squirms looking at people in hopeless situations like amputees. Listen to this podcast before your next trial comes! On Sunday Feb 4, we took our autistic son Zachary to the hospital ER because he was not improving from what we thought was just a flu with fever. They determined he was septic with a pneumonia from some unknown infection source and put him in ICU. 23 days later, he is finally home as of Feb 27. He still has some coughing to still clear up and weakened legs to rehabilitate. About the photo above: Zach being wheeled out of his home for the past 23 days.